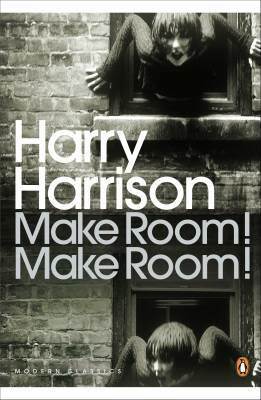 Harry Harrison’s 1966 novel, Make Room! Make Room! is probably more familiar to people through the film, starring Charlton Heston, Soylent Green which I’d seen several times before I read this book. It had been out of print for a good number of years and, having enjoyed the film based on it and, when younger, a number of Harry Harrison’s other novels, I’d been quite keen to read this. So when it was republished I was a happy SF fan. The novel itself is a dystopia, set in 1999, then the future. It has an ecological premise; the world is unable to sustain the human race. The plot of the book concerns the attempts by policeman, Andy Rusch, to investigate a murder. In the imagined future, the investigation of a murder was fairly rare, because the police had to spend so much of their limited time and resources controlling desperate and hungry people. Fans of Heston’s film should note, also, that the central revelation of that film is absent from the novel (let’s face it, there’s more than a reasonable chance that even if you’ve not seen the film, you know what that is). The world depicted in Make Room! Make Room! is a compelling, if unrelentingly grim, one. The environment is the enemy, though the slant in this is slightly different from a lot of other ecological apocalypse fiction. The tendency (as far a I’ve noticed anyway, and this isn’t absolute – I’m sure I could go and find some other, differing, examples) is to portray the environment becoming overloaded with toxins due to our thoughtless use of resources, or for one big man-made event to cause an ecological disaster. In the case of this novel (and this probably has a lot to do with when the book was written) it is purely a result of our desire to end death. The dire situation that humanity finds itself in, is caused by something almost unquestionably good (though there is also the theme of access to birth control, in the mid-sixties in America, a huge issue). I should point out here that I imply no luddism on my own part by distinguishing between the causes of the catastrophe in this and other novels. Progress is a good thing. To point to a crude example would be that the Soviet Union sought economic progress, and undeniably got it. However, many of the environmental consequences of this were unquestionably catastrophic. My point is that the eradication of death and disease are hard to find any fault with, whereas there are some human economic activities which have visible and immediate consequences when we consider the impact that they have on the way that people live. There are some obvious criticisms to make of Make Room! Make Room! Written in the 1960s, it deals with the consequences on human beings of unchecked population growth. Set in 1999, it offers a world of 7 billion people that can’t feed itself and the action happens in a decaying New York of 35 million people. Clearly, this didn’t happen, so if one were to be lazy, you could dismiss the book out of hand by pointing out how “wrong” Harry Harrison was. Whilst the direst predictions perhaps didn’t come true, it’s worth pointing out that it’s just fiction! Science Fiction at that! While the failure of prediction is there, the wider themes of how we use and distribute resources still provoke thought today. It maybe true that New York hasn’t become as degraded as depicted here, that is not to say, however, that we have suddenly solved the problems of how resources are distributed in the world. From that point of view, the novel still resonates. However, I couldn’t love the book; though my problems aren’t with it’s inaccurate depiction of the world, well, in our past now. It’s very much a book of the 1960s and read in that context, it’s interesting – there are many themes relevant to that era that you can follow – but I just wasn’t overly convinced by the book as a whole. It’s enjoyable, but not great. It moves at a decent pace and, in spite of the grimness in it, it has moments of wit. I don’t think you’d regret reading it, but there are far better examples of the genre available than this. There are some good attempts on the internet at the moment to reappraise some of science fictions classic works, especially those that have been out of print (there are a few, but SF and Fantasy Masterworks Reading Project is a particularly good example). One of the questions that reviewers often ask themselves is, is this book worthy of being called a masterwork? Of course, things are slightly more complicated than that; it’s suggested sometimes that many of the works that find themselves in the two series that Gollancz publish get there by dint of the fact that the rights are available, while I’m sure that there are other – undisputed – classics that won’t get into it because someone already holds the rights and publishes it. This isn’t published in that particular range, instead, it is a Penguin Modern Classic. It is certainly heartening to see SF getting picked up by Penguin to publish in this range. However, I’m not convinced that it’s necessarily always the best examples of SF that have made it there. While Make Room! Make Room! unquestionably has something to say for itself, and isn’t an unpleasant read (I’m glad I’ve read it now), I can’t really suggest than anyone rush it to the top of their “to be read” pile unless they have a particular reason for wishing to read it. This entry was posted in Review and tagged environment, grim, harry harrison, novel, sf, usa. Bookmark the permalink. As a big fan of the Penguin Modern Classics range – though I need to read more of them, rather than just acquire them – it is good to see them branching out with what they mean by a classic. Some sf, granted it’s pretty much the Wyndham novels, have been in the series for a while but now we’re seeing this novel, Walter Tevis’ The Man Who Fell To Earth, Brian Aldiss’ Hothouse, and recently, one from the vaults, in Fred Hoyle’s The Black Cloud. Long may it continue. Yes, I think you’re right. I’m probably being a little unfair on this particular book; for while I do think that the writing is leaning to the wrong end of pulp, it is very much a book of its time. Being fair, it does have plenty to say about the mid-1960s and the (almost unbelievable now!) debates that were going on in the USA regarding contraception. From that point of view, it is as deserving of being a “Modern Classic” as (say) Sloan Wilson’s The Man in the Gray Flannel Suit. I suppose I should be glad to see as much material kept in print as possible. The Modern Classics range is mostly good though: I’ve read in it some of the obvious candidates for “classic” status, but they’ve also put out some interesting stuff from the likes of (I dunno) Eric Ambler and Sam Selvon. Det mÃ¤rks tyvÃ¤rr pÃ¥ spelet att det har varit under uteniklcvg vÃ¤ldigt lÃ¤nge dÃ¥ tekniken och systemet kÃ¤nns ganska gammalt redan, men rollspels effekten Ã¤r indeed ett mycket bra tillskott till genren. Any1 have detail about ex-President Roh had planned to airraid by crusing missile toward SDF facility in Shimane , which Washington post news dated on 21APR2006?